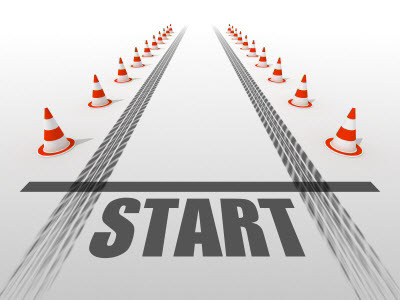 Are you considering starting up your own business – a full time or even part time venture? It’s an admirable move – but one you need to approach with the right mindset and processes or else being your own boss can become a nightmare. Passion: Go into something because it is an area of interest / you have a passion for rather than because the money to be made appears to be too good. That way, your business becomes fun rather than a chore and you won’t think twice about putting in the sort of hours which may be required. Brainstorm: Find people with whom you can brainstorm ideas and strategies. Everyone has an opinion but be careful to avoid those who venture views which are negative and / or are driven by emotion. Family members are often the most supportive but not necessarily able to divorce emotion from practicality. There are many mastermind groups now available … or invite others to join you in setting one up. Budget: Create a budget and then halve the sales and double the costs. The reason is that things always take longer – and hence cost more – and sales generally flow at a slower pace than you anticipate. Be Realistic: It takes time for a business to produce a positive return. Yes, there can be cash flow almost immediately in many businesses but the reality is that most businesses need 2 years or so before achieving break even. Re-investment is therefore imperative. Consider everything you do today as a step towards that point. Complete Tasks: Don’t start something unless you have the time to complete it. If it is something which needs to be done over a course of a week, then schedule your time to ensure each step of the process is completed. Think Global: Most people like to deal with someone they know like and trust on a local level. However, if you gear yourself to only operate “locally”, then you could be missing a potential market and your business will never scale. Roll Up Your Sleeves: When starting out, roll up your sleeves and do things yourself so that you can get things in place exactly as you want them. Be careful not to stay with this mindset – at some point when cash flow is sufficient, you need to pass on responsibility for some of these “start-up” functions so that you can concentrate “on the business” rather than “in the business”. Gadgets Don’t Make You Money: Unless your business is technology driven / oriented, you don’t need the latest computer or cell phone. They are luxuries you should avoid wasting money on. Don’t Limit Yourself: Sure, become a specialist in a particular area but get yourself geared to earning secondary income through additional avenues either through distribution rights and / or as an Affiliate so that you don’t have to turn your back on opportunities for extra cash flow or to consolidate the relationships you enjoy. Control Your Costs By Outsourcing: Identify good outsource partners and have them perform tasks on your behalf rather than trying to do everything yourself. Ensure they are both skilled in what you need and reliable. Avoid Listening To And Using Hype: Keep away from those who hype everything up and most importantly, avoid doing the same yourself. People like straight shooters. Be Active Online and Offline: Don’t limit yourself to one or the other channels. You do not need to be highly technical nowadays to establish an online presence – and you can multiply your online earnings by adopting offline strategies. Don’t Make Commitments You Cannot Meet: It’s always tempting to say “yes” to each and every opportunity which comes your way, but if you do that in an area you cannot fulfill, then you can damage your reputation even before you get rolling. Don’t do so under any circumstances. The above are all basics which can be overlooked in ones haste to get things happening. Make sure you take all of them into account during the planning of your business at start up time – and on an ongoing basis.